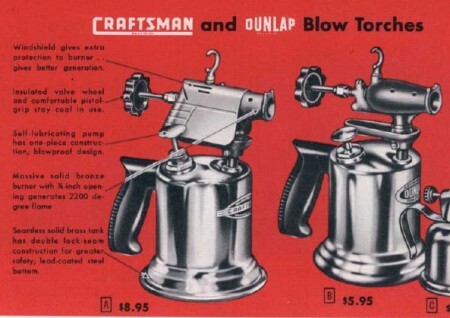 This 1949 Craftsman catalog brings us back to the days of zoot suits, the jitterbug, explosive shop tools, guiltless gasoline consumption — and the good ole’ gasoline blowtorch. 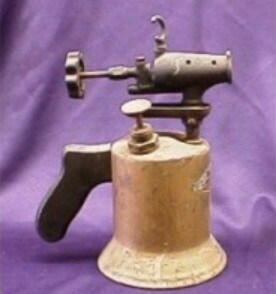 Even before the modern technology of propane and butane cartridges, amateurs as well as professionals commonly used blowtorches for stubborn household problems like thawing frozen pipes, loosening jammed bolts, and even detecting freon leaks (due to the changing color of the flame). Plumbers used the torches to liquefy lead for sealing pipe joints, electricians used them for soldering wires, and painters for stripping paint from walls. To operate these blowtorches, you fill the fuel tank about 3/4 full of gasoline, and then seal the fuel valves. A hand pump pressurizes the air, sending the fuel up a wick tube to the burner head. The wick tube contains a cotton wick about eight inches long, with half of it soaked in the fuel and the rest leading up to the burner. Just past the wick tube, a screen filters out impurities before the fuel is burned. Finally, an evaporation chamber on the bottom of the blowtorch head builds pressure between the wick and the burner head. The fuel escapes through the orifice in the burner head, producing a very hot, blue flame and the familiar roar of the blowtorch. If you’re worried about frozen pipes this winter, you can buy the antique Craftsman blowtorch pictured above for about $10 on eBay — the same price as in 1949. For the same (adjusted) price as back then, you can even fill it up with gasoline — just like the good old days. My dad took a gasoline blowtorch and made it into a lamp. For some reason, I thought my mom made him get rid of it at some point. You can imagine my relief when I saw it in the living room the last time I visited. That lamp is my birthright. I have a couple of them like the ones in the pictures. One of them leaks, but the other one is intact, and I’ve fired it up a few times. It’s important to prime this much like you would a white gas stove; put some gas into the primer pan (opening and closing the valve after pressurizing is enough), light it, and let it burn down. If you don’t preheat it like this, it becomes more of a gas squirt gun/mini flamethrower rather than a torch. Kind of neat looking, but not very useful or safe. Incidentally, the “hook” on the top and the groove on the top front of the barrel was so you could lie a soldering iron on top. The old-style irons were basically just a shaped metal rod with a pointed tip on one end and a handle on the other. The handle would keep it from slipping through the upper ring, and the tip would sit nicely in the flame. Under no circumstances use a blowtorch to look for freon leaks. Combusting freon releases phosgene gas, which is quite toxic and at one time was a chemical weapon. Buy an electronic sniffer if you ever need to do this. Looks like the same basic principle as our old Svea 123 stove http://en.wikipedia.org/wiki/Svea_123 which you more or less set on fire before using. We had one of these back on the farm (late 60s, early 70s) that we used all the time, when you REALLY needed something heated up. The propane torch just didn’t have the right stuff. We fueled it with “white gas” (no additives and was unleaded) that used to be really cheap, of course during the so-called “gas wars” among competing stations gasoline would get down to 25 cents/gallon anyway. tmib is correct you have to get it pre heated or keep it pointed well away from anything you value! It’s a wonder we never burned down the old garage, with the gas and diesel storage tanks next to it, various fuel burning torches, heaters, electric welders and my favorite, the arc torch! Good times….. good times. The newsletter group “Blow Torch Association of America” BTCA exists to make collecting torches more enjoyable. The newsletter “The Torch” is published three times a year. For information about this group and regardingt the 500 page book “Vintage Blowtorches” by Carr, Smith and Stubbs, contact Ron Carr at BTCA@COX.NET. Nothing scary about these old torches if you follow commons sence safety rules. They must be respected, cleaned and kept in good order for safe use. I have several all different and best suited to different aplications. Propane is instant heat and that is its advantage. Gasoline is ( Naphtha used in some ) is cheap, much cheaper than propane these days. And the heat well there is a lot more of it if you need it lol. My two most commonly used torches are a Preway 45, small light and very well behaved. And my other is a C&L 308 heavy but ready to use in under 30 seconds with its secondary preheat burner. I’m a pilot with a need for a blow torch that uses gasoline. The old Alaskan Bush pilots used blow torches to preheat there aircraft engines in cold temperatures. The cowl flaps (air vents under engine) are opened and a length of stove pipe is inserted, the blow torch is lit and set on the ground with the flame blowing in the lower end of the pipe. Roughly an hour would be enough to heat the engine this way. In about 2 weeks my wife, our two children and myself will fly our Bush Plane from California to south central Chile where we intend to live. It is for this reason, and that we will often be remote and without electricity, the old bow torch would do an outstanding job. When I was a kid growing up I used blow torches quite a lot, (my father was a boat builder). The only ones I can find now are on E Bay and I can not easily verify that they actually work. If someone has a basic, but good quality and fully functioning blow torch that I could buy, (including spare leather, etc.) please let me know. I’m a writer and I finishing up a juvenile novel which involves a blowtorch from the 1950’s. Were most or all the blowtorches from back then gasoline? Also, how HOT did they get? I read 2000 degrees and 5-6000 degrees, so just wondering if anyone had any info. I haven’t been able to find much regarding the history of the blowtorches and I’m very keen on getting historical facts right. I just found this website and noticed your question. Enlarging the Craftsman photo reveals they advertize 2,000 degrees F.
You likely know this by now. I have two of these torches and one is stamped on a plate on the side of it “Chicago 1923”. Both of them also have the “cannister” / tank that goes underneath them. Does anyone know what these are worth? Thanks. I have an old Primus blowtorch and it won’t fire up. What are the likely problems I need to deal to: with quite a few tries I can get the flame to go green but it requires constant pumping of the pressure pump. The flame wont last either. I have obtained new pump cups from a Turk on eBay, and have re leathered the gasket on the fuel knob. Have I missed any? What else could it be? Does seem to need better pressurising. Stepahanie. You have a pressure leak in your torch. You said you “re leathered” the fuel knob? I assume you mean the “packing nut” that the valve stem passes through. This is likely where you are loosing pressure and likely fuel too. This is “packed” with a graphite string and not leather. You can get this at your local hardware store. Just use caution and make sure the valve stem is clean (you can polish it with fine emery cloth or 3M) and don’t over tighten the packing nut as the burner heads are made of bronze usually. In your pump, make sure you check valve is working and rebuild if it is not. You can check for air leaks with soapy water. I rebuild and use these torches all the time, their fun and very safe if you pay attention and respect them. Good luck. Hi Kyle, I have a primus torch 636 which does not build up preasure, haven’t done anything to it yet, what do I need to do to get it serviceable again? Hope you don’t mind me asking but can’t seem to find alot of information regarding the primus torches and your the only one as to yet that has the knoe how. i just found 1 of these with my father in law in his fathers basement, its the coolest thing ive found in a long time. I have 2 old blow torches. No Dates. One is a Primus 630N made in Sweden and marked for use with Kerosene. The other by OTTOBERNZ in Rochester N.Y. ‘200’ stamped on the steel handle. Marked for use with Regular gasoline without anti-knock (lead) additives. It is highly polished and won’t likely be fired up. There are 2 needle or clean-out screws on the top portion. Thanks for the ‘hook info’. Now I need to find an old soldering ‘Copper’. They were about 1″ square and had a diamond tip at the soldering end. Iron/wood handle. Was the ‘pan’ beneath the flame tube to be kept lit? does anybody know how the wick goes attach to the fuel feed tube and where I can find the right wick for a blow torch , thank you. O.K. Wicks first. You can use strands from a cotton mop head. About eight inches will do. You just push (while twisting) about three to four inches into the bottom of the fuel tube. You want about four inches of wick in the bottom of the tank. Now, how to correctly light one. This is how I do it. 1. Have a good fire extinguisher handy. Don’t light one without one. 2. Fuel torch. I use unleaded gasoline in mine. Cheaper than Coleman fuel and it’s just about as safe. Just pay attention. Fill about half way. 3. Seal and pressurize tank. Thirty pumps does it. 4. Let it sit for a few minutes while you check for leaks. 5. Fill preheat tray (I use alcohol as it does not soot), to about three quarters full, and light with a small butane torch. 6. Let the torch preheat, until the alcohol is mostly gone. Take note; the burning alcohol will flare up as it heats. This is normal so don’t panic. 7. When the preheat fuel is almost gone, open the burner valve. The torch should light. If it does not, the orifice may be clogged. Let cool and clean. Preheat again. That’s it. To shut down, just turn off the fuel valve. Make sure the flame goes out. Wait a minute or two to make sure, and then crack open the pump nut (this is how I fill my torches) to release the pressure. Let the torch cool before bringing it inside. Oh,yeah. Don’t light these inside. Have fun, as this is a great hobby if your a pyro like me and want to play with fire and not go to jail. Enjoy and torch safely. One thing I did forget. Make sure after you pressurize your torch you look for the “vigara effect” on the pump. If the pump rod rises your pump check valve is leaking and fuel will be filling the pump chamber. Do not light the torch if this occurs. Also, you should not have to pump up the torch at all while it is running. It should keep itself pressurized until it is almost out of fuel. If the flame dies down, you have a pressure leak somewhere. Find it and fix it. Pumping the torch while it is running can be dangerous if the check valve is leaking. If pumped gasoline will be ejected from the pump where the rod passed into it, and you will get sprayed with gas. This is bad as it could blind you. This would be much worse if the torch is running. Don’t do this. Sorry. I meant to say “Viagra Effect”. My bad. If anyone has any question I can help with, just look me up on Facebook and ask me there. I have a wall superior blow torch, does the pump supposed to pump up pressure in the tank without gas in the tank, I have pumped mine and opened the valve no air comes out, I haven’t tried to light it yet just checking the pump first , I oiled the plunger and checked the valve at bottom it looked good put pressure in the tank don’t seem to pump up. I have an old gasoline torch with a 4″by 2.125 dia. tank. no pump mechanism. the only marking is a placard with the word gasoline.can anyone all me how this thing works? I have an old (possibly 1940’s) Radius 52 blow torch (lamp) which belonged to my father. It needs some new spare parts like the bottom washer on the pump. Made in Sweden. I live in the UK and cannot find any information on our websites to help. Once again, America takes the lead! Do you know of any connection where spares can be obtained. It is mainly washers at this stage and how can it be tested safely?